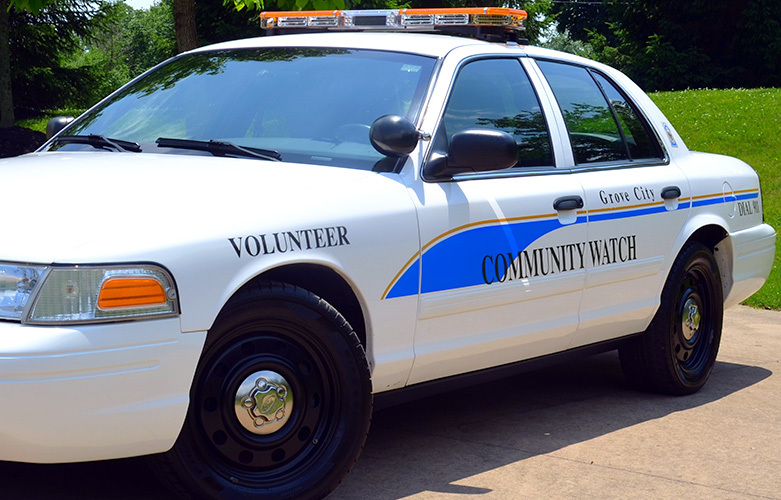 The Grove City Community Watch Volunteer (CWV) Program is comprised of dedicated community citizens who form a partnership with the Grove City Division of Police to assist in the public safety program within our city, by donating their time. These devoted volunteers serve as additional community eyes and ears to support our law enforcement team. CWV members are well trained in this vital community service program by first graduating from the Grove City Citizens Police Academy. Additional training includes improving observation techniques, radio communication, vehicle lockouts and preferred community interaction techniques. Supporting the mission of the Division of Police, CWV graduates act as police ambassadors and assist in various crime prevention efforts, traffic safety situations and assist at special events. The program has proven to be an effective approach to residential safety and community relations, while serving as a deterrent against unlawful actions. To enhance visibility and mobility, two decommissioned cruisers from patrol service have been outfitted to support the program and its members. The vehicle is lettered with prominent Community Watch markings to encourage resident and business interaction. If you would like to learn more about the Community Watch Volunteer Program or the Citizens Police Academy, please contact the Community Services Bureau at 614-277-1742.